Lt. John Boles: Goodbye Iris. both humorous and haunting-an out of this world cinematic thrillride! 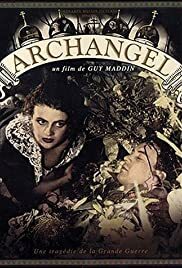 Part black comedy, part romantic drama, and part horrific war film-"Archangel" manages to blend these genres with its consistent surrealist style, the style that practically all of Canadian filmmaker Guy Maddin's films are made of. Before I continue this review I'd like to point out that I absolutely ADORE the films of Guy Maddin. I think of him as the Canadian David Lynch (and Lynch is my all time favorite filmmaker, so that's high praise), but comparing him to other icons doesn't truly do his work justice. He certainly has his own, distinct style, his films always mimic the visuals of a silent film, particularly those of Eisenstein. He also experiments a lot with use of overdubbing dialogue, a dreamlike atmosphere, and bizarre, dark humor. His style is not for everybody, but for those that can appreciate this oddball genius his films come across like underrated treasures, and "Archangel" may just be my very favorite. This film is both gruesome and powerful, it makes a statement about dealing with love and loss, while also entertaining us with its wacky plot and laugh out loud humor. I had a ball watching this bizarre, tragicomic tale, mainly due to its fast paced nature and heavy surrealism. Those who seek an other wordly experience will likely adore this film, for I think it best captures Maddin's famously odd style. The acting is at times somewhat wooden, but its obvious that this is the movie's intent. Much of the jokes are performed in a completely deadpan and slightly awkward manner, which makes them even funnier. The dialogue is great, the visuals are beautiful, the story is brilliantly weird, and I cannot find a single problem with this little masterpiece. Those who enjoy the avant garde must see this film as soon as possible!